HQ Nightclub Set to Reopen May 15? HQ Nightclub Set to Reopen May 15??? I told them they should not come in until I have an attraction, which is a casino, or a strip mall, or an outlet mall. But they’re saying they have enough following, they want to open up.” The proposed date for HQ Nightclub and Jose Garces Restaurants to re-open is May 15th. After nine months of litigation, constant back and forth with tenants and $82 million, Glenn Straub finally is the new owner of the once bustling 6.3 million-square-foot beachfront property, Revel Hotel and Casino. Now that Revel has a new owner and a new outlook, it will be very exciting to see where Glenn Straub may take it next. Straub has not made any promises of exact dates or timetables. However, he has released a redevelopment plan for the reopening of his newly purchased property. He has dubbed it “The Phoenix Plan”, a $500 million redevelopment plan, not only for Revel, but Bader Field as well. Plans call for equestrian fields and docking at the field for high-speed ferries and helicopters to and from New York City. One of Straub’s biggest obstacles to purchasing the property was opposition from Revel’s tenants, such as HQ Nightclub, Jose Garces Restaurants and ACR Energy. Their lawyers said the sale would cause the tenants to lose their entire investments. In HQ Nightclub’s case that would be upwards of $16 million. ACR would lose upwards of $160 million. According to Philly.com, Straub said he has reached a deal with Jose Garces Restaurants and the HQ Nightclub. 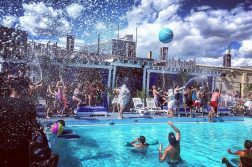 So Revel is set to re-open on Friday, May 15, just in time for summer! With the tenants’ optimistic outlook, it seems Straub is in cahoots with them. Even Straub himself said, “They should not come in until I have an attraction, which is a casino, or a strip mall, or an outlet mall”. The tenants have a different feeling, according to Straub. “They’re saying they have enough following, they want to open up”. HQ Nightclub, Restaurants, Whats Next? As of right now, it is hard to say what is going to happen at Revel. One thing Straub does have is a real-life plan. It will transform the beachfront property and hire 6,000 people by building an indoor/outdoor waterpark costing upwards of $100 million. He has not decided on the opening date but some of his plans could be as close to a year away. He refuses ruling out opening for the summer of 2015.